Enhance the look of your home with distinctive grid styles for your windows. All grids are between the glass so they won’t get in the way when cleaning the windows. Learn more about ProVia stained glass, internal window grids, privacy glass, and simulated grids. When using flat (standard) or sculpture grid types, the color of the grid will match the color of your window. The number of grids used in a colonial (standard) and diamond patterns vary depending on window size. Simply choose a grid pattern and type to fit the style of your home. Heat-reflective laminates are designed to perform in the bitter cold or the scorching heat. Virtually maintenance-free, laminates feature the highest quality AAMA certified vinyl lineals available today. With a limited lifetime warranty, these laminates are sure to make any home look its best, year after year. Our manufacturers let you maximize the beauty and impact of your new door by providing you with the largest selection of clear and decorative glass options. We take great pride in presenting a beautiful, creative and exciting collection of decorative glass designs with unsurpassed quality and craftsmanship. Decorative glass will embrace the natural light and transform it into a creative and beautiful presentation leaving a lasting first impression. Common in bathrooms, obscure glass make it difficult to see inside. Objects further behind the glass are more difficult to see. 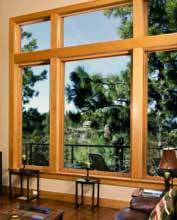 Below are examples of ProVia privacy glass.